I'm crazy about these eye-catching art pieces my friend, Allison Patrick, has been making. She's always coming up with interesting ideas... you might remember the quilled New York City skyline I featured a while ago, and more recently, her ruffled pendant lamp. Once again, Allie has created something that fits right in with the theme of her blog, The 3 Rs - Reduce, Reuse, Redecorate. No doubt the title of this post gives away the main ingredient, but if I didn't know better, I don't think I would have guessed that the bright stripes were slices of paint chips - at least not from a distance. The idea makes me think of Jessica's thumbprint paper cuts, not only because it requires the use of a craft knife, but because the end result is chic and economical... a perfect project to dress up bare apartment walls. 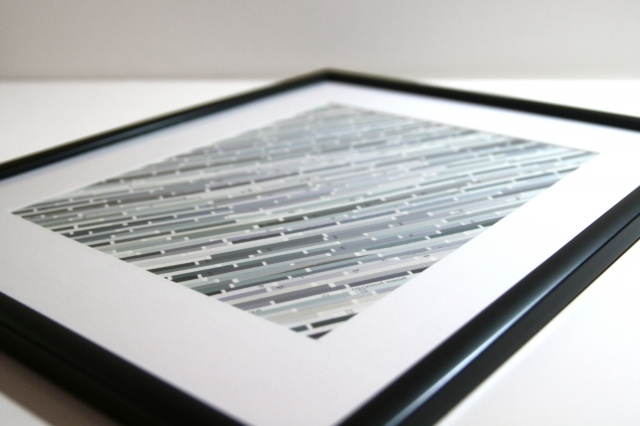 Here's a pair of framed pieces Allie made in cool shades of blue and grey... just as attractive as the brightly colored version, but a completely different and serene look. Allie has done lots of paint selecting for her own apartment, her parents' houses, and interior design clients, thus she has an abundance of paint chips. I don't know about you, but I've thrown away quite a few chip strips in my day - too bad I didn't have Allie's foresight to hang onto them. Allie says, "When I paint a new room, I spend a lot of time picking just the right paint color. 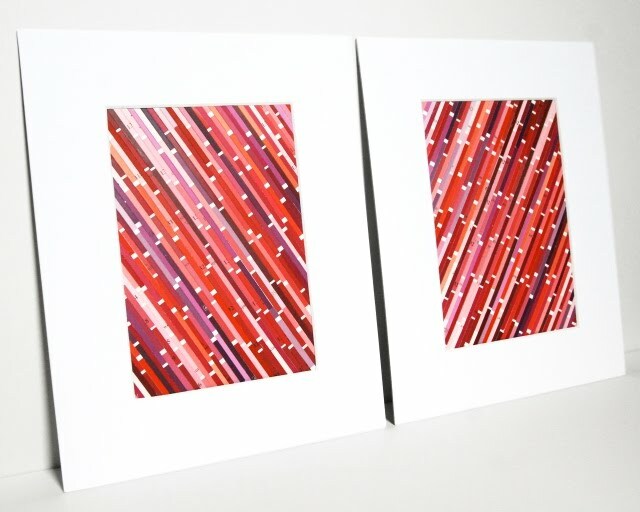 This process involves collecting as many as twenty options and carrying them around with me, so I can see how they look in different lights at different times of day." "While this process is beneficial for the room, it leaves me with lots of paint chips. Smart people might throw them out, but because I'm a bit of a hoarder, I have stacks of chips at the ready. I've always had this sense that one day I would find a use for all these carefully saved supplies. Finally I found one! And because each stack of paint chips comes from a specific room, once I've created my art pieces, I know they'll complement the walls perfectly." Allie and I are definitely not condoning running into your nearest paint store to grab up a supply just for the sake of making wall art! 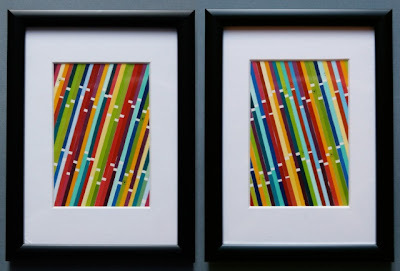 If you're not the type to take on a fiddly project that involves a good bit of cutting and gluing, Allie sells paint chip art in her Etsy shop, Zipper 8 Design. Truly one of the most creative reuses/repurposings I've seen. Wow what a neat idea! This is such a great idea ,and so are so many others in her blog. I hope to learn a lot from her blog. Clever! 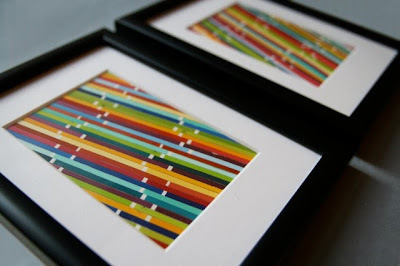 I 'm wondering if a similar effect could be created using graduated quilling strips, too? I also have quite the stash of paint chips but have never found as good a reason as this to use them. They're awesome! Thanks for all the great comments! I'm glad everyone loves my paint chips, I'm just glad I finally found a use for the huge stash I've collected over the years! Thanks Ann, the post is fantastic!! hahah between those sherman williams commercials with the paint chips, and allie's inspiring work, your warning is totally warrented! hopefully stores don't start charging for them! i LOVE the fact that the finished paint chip pictures coordinate with her rooms - so clever. 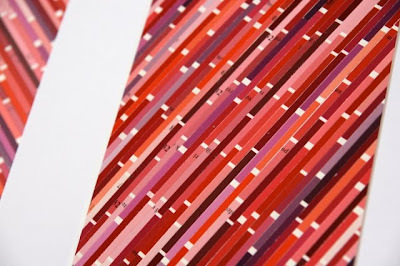 Philippa, great idea about using graduated color strips to get a similar effect! That would be even simpler than using paint chips. Carole, I'm honored, thank you! This is really great! I have drawers full of paint chips that I have been hanging on to for years! Maybe this will inspire me to actually do something with them other than hoarding! Thats such a great idea! I have a shoe box full of paint chips that I've been saving from when I was in interior design school. I'm so glad you and Allie both make a point of saying these are paint chips she had. I've seen other paint chip art (not like this, at all) and sort of assumed the artist took the chips from a store for the express purpose of her art. I don't know that - but it bothered me that she might have. Anyway - love these pieces! Stefani, I hear you and completely agree. The whole purpose of paint chip art is reuse. Thanks for the inspiration, I made some whimsical face art out of paint chips!